Are you looking for a new pair of quality, designer eyeglasses? Is it time for your vision test and comprehensive eye exam? Do you need treatment for an ocular disease? 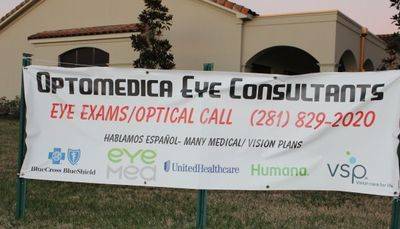 No matter what you require – from simple to complex – we will satisfy all of your vision and eye care needs at Optomedica Eye Consultants, in Katy, Texas. Our entire team is committed to providing you with first-rate, compassionate service. With a personal interest in every patient, new and existing, we’ll listen to your eye history, visual needs, lifestyle considerations and any concerns about symptoms that you may be experiencing. Dr. Lorena E. Castaneda, our experienced and skilled eye doctor (also fluent in Spanish), strives to help everyone in the Katy, TX, area to achieve clear and healthy vision. Our practice is family-friendly, serving neighborhood residents of all ages and matching the population of the region. Located within the Houston-Woodlands-Sugar Land metropolitan area, Katy, TX, offers many fun family attractions. For a day trip spent outdoors in the fresh Texan air, the Mary Jo Peckham Park is a great site. Bring your fishing poles and cast a line to reel in catfish, rainbow trout and bass from this family fishing lake. While no swimming is permitted in the lake, a community center and swimming pool are also on-site to make water-lovers happy. With a miniature golf course, gazebo sitting areas and plenty of picnic tables, a full day can be enjoyed in this Katy, TX, recreation area. Anyone in our community who prefers activities in the air versus water will likely be familiar with Space City R/C. This members-only club features a grass runway of about 800 feet long and 350 feet in width, where all models of radio-controlled (R/C) airplanes can be flown. Started in the 1960’s, this club currently has approximately 90 members and 12 acres of land near the Katy/Hockley Road. A warm camaraderie pervades the place, with everyone dedicated to celebrating and enjoying R/C flight. If you’re interested in gazing at the sky and tracking the path of these radio operated airplanes, it’s worthwhile to visit our Katy, TX, optometry clinic for an eye exam. If we diagnose a vision condition, we’ll help you choose the ideal eyewear for all your needs. We have a large collection of designer frames in stock, including specialty eyeglasses for your hobbies and outdoor activities. However, an eye exam by Dr. Castaneda doesn’t stop with visual acuity testing. We will inspect your eyes thoroughly for any signs of ocular disease or abnormalities. If you are diagnosed with an eye disease, such as macular degeneration, glaucoma or cataracts, we’ll co-manage treatment to prevent future complications and loss of vision. Patients who would prefer vision correction without eyeglasses will be pleased to know that we provide total preoperative and postoperative care for laser vision surgery in our Katy, TX, office. If you’re not a candidate for laser surgery, contact lenses may be a good option. We are pros at performing all contact lens fittings, including for specialty, hard-to-fit lenses. Contact Dr. Castaneda to schedule an appointment for more information. When the weather is too hot or extreme to spend time outside, head for one of the many fun indoor recreation sites in Katy, TX. Tilt Studio is sure to thrill kids of any age, filled with spinning lights, popping sounds, smiles, squeals and pure excitement. In addition to awesome video games, you can choose from Laser Tag, Mini-bowling, Black Light Mini-golf, Outrun SP Deluxe or the dizzying Tilt-a-Whirl ride. It’s a favorite spot for birthday parties, as well as group and corporate event outings. If you find the bright lights and action of Tilt Studio a bit overwhelming, you may want to try out Times Square Entertainment as an alternate indoor venue for good ‘ole fun in Katy, TX. With their comforting motto of “Good Friends, Good Food, Good Times”, this sleek, modern bowling alley also has a great Sports Bar and Grill. Regulars should be sure to sign up with one of the creative leagues, such as the Friday Night Couples League or the Women with Wine League. History buffs and those who seek a cultural experience are encouraged to visit the Katy Heritage Museum, with vintage farm tools and fascinating artifacts from the region’s agricultural pioneers. The Katy Veterans Memorial Museum is located close by, where a top-tier military exhibit can be viewed. As you enjoy all that Katy, TX, has to offer, don’t forget to leave time to stop in and check out our eyewear collection, or to schedule your eye exam at Optomedica Eye Consultants!